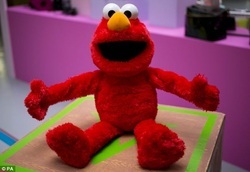 The playful and high-pitch voiced Elmo has been a hit with kids ever since he debuted on Sesame Street years ago. This Playskool Elmo is really big into hugs, giving and receiving, and the familiarly colored red plush toy dances and sings, and even cuddles with your little one. Let us take a more revealing look at the Big Hugs Elmo, and see just what he has to offer your child. What Makes Big Hugs Elmo a Great Purchase? 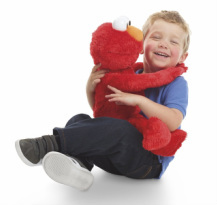 Perfect for young kids through the kindergarten age, Big Hugs Elmo is almost kid sized. A little larger than some previous Elmos (22 inches tall and over 2 pounds), the cuddly, plush doll is recommended for children from 18 months up. The toy is soft, but is also durable, and just like other Elmo models, enjoys singing, talking and interacting with your child. The Hasbro Playskool Sesame Street Big Hugs Elmo knows more than 50 positive sayings and phrases like "Elmo loves getting hugs from you". When you tell your child it is time for a nap, you can have Big Hugs Elmo sing a lullaby and lay down as well. One neat feature is the sleeping sound effects that help your little one fall to sleep. Elmo can dance, sing and talk, and has four different imagination modes where he pretends to be an astronaut, a rabbit, a horse and a frog. Driving your child's imagination and social interaction, Big Hugs Elmo uses three fun songs and action statements like "Let's pretend we're rabbits! Boing, boing, boing" to keep your child active and engaged. While kids don't seem to notice at all, and Elmo is soft, he could be softer. But his hair or "fur" is extremely durable, and that probably detracts just a little bit from the softness aspect. Also, as an adult you will instantly feel the components and battery box inside the doll's torso, but again, children do not seem to care. They fall absolutely in love with Sesame Street Big Hugs Elmo just as they have with previous Elmo models. Get someone with small hands to install the four AA batteries, because this can be a little tedious. Other than that, this is another great Elmo for your young ones, which once again teaches positive lessons and keeps your child active and imaginative.